Battle to claim spaces, control them to score points. But be prepared… a well timed action card can support or hinder any player’s game — including your own! 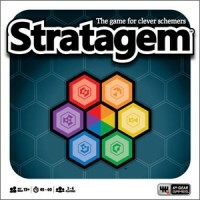 Stratagem is simple game perfect for family fun night, but also substantial enough to be a go-to game even for the avid gamer. 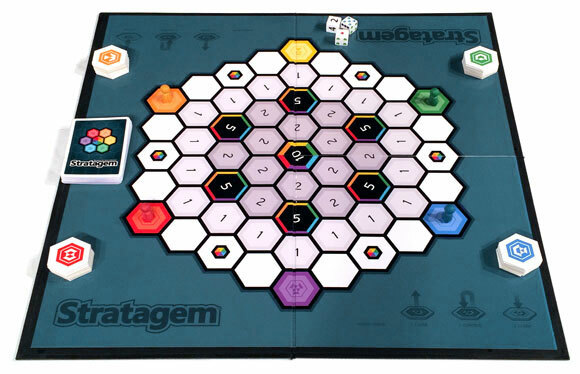 Stratagem is a roll and move based game. Players take turns moving their pawns around the board, claiming each contiguous space they enter with hexagon tiles. Points are scored for each claimed space that survives a round and is converted to a controlled space. Action cards may be played during the game to a player’s advantage. Avid gamers may prefer a more strategic rule-set, one that relies more heavily on the player’s skill than the luck of a die roll. In this variant, players must move three spaces instead of rolling a die for movement, putting the player’s fate in their own hands. NOTE: As of May 30, 2014, the initial Kickstarter campaign did not fund successfully. 6th Gear Games promises a relaunch, but it has not yet been scheduled.